What is the abbreviation for Persistently Intimidating Technology Syndrome? PITS stands for "Persistently Intimidating Technology Syndrome". A: How to abbreviate "Persistently Intimidating Technology Syndrome"? 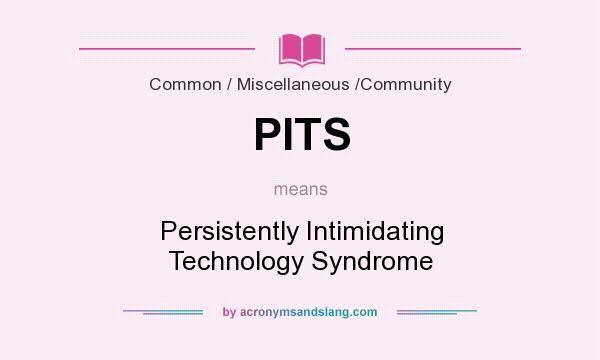 "Persistently Intimidating Technology Syndrome" can be abbreviated as PITS. The meaning of PITS abbreviation is "Persistently Intimidating Technology Syndrome". One of the definitions of PITS is "Persistently Intimidating Technology Syndrome". PITS as abbreviation means "Persistently Intimidating Technology Syndrome". A: What is shorthand of Persistently Intimidating Technology Syndrome? The most common shorthand of "Persistently Intimidating Technology Syndrome" is PITS.